Throughout this episode everyone remains imprisoned, affording time for Kaisar and Favaro to catch up, while Nina impresses by making hard labor look comically easy and ends up befriending Jeanne. 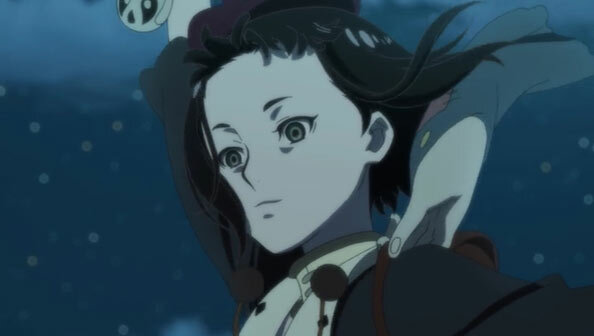 Both Kaisar and Favaro know Nina, and both Nina and Jeanne know Mugaro. What could have been a static table-setter is infused with bottomless sources of magnetism thanks to the official infusion of Favaro (and Jeanne) to the arc, and a measure of “freedom” is lent by taking us back to when he came to make Nina his apprentice. That story provides some of the best laughs of the series, as Favaro and Nina prove to have fantastic comedic chemistry. 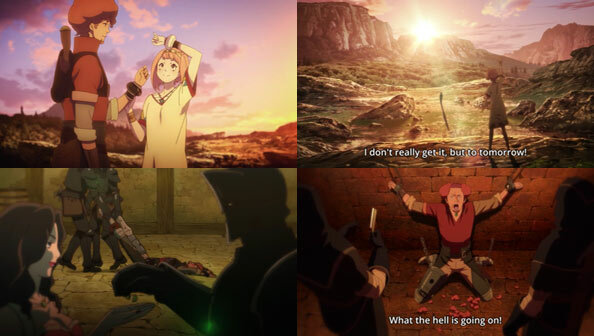 Favaro arrives at the dragon village to eat, drink, and screw away his earnings, but the second Nina hears that he’s a bounty hunter, she wants in…and Nina gets what she wants through boundless perseverance (read: Favaro gives up trying to run away from her). Nina’s feats of strength impress Favaro, but her more fine skills such as marksmanship and whipcraft leave a little to be desired. When Favaro enjoys the village’s famed hot springs, he ends up learning about Nina’s transformation ability when she dives in not knowing he’s there. 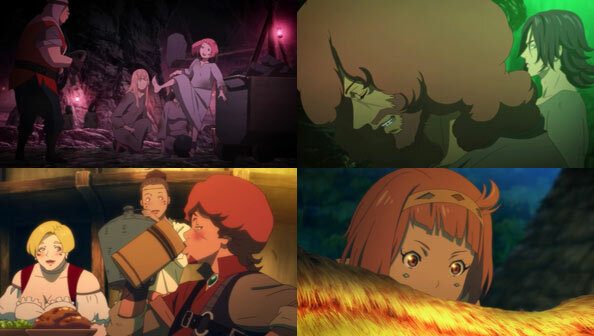 Favaro only agreed to have Nina as an apprentice while he’s in the village, so when he leaves, he decides there’s no more he can teach her—which…wasn’t all that much to begin with. After all, you can’t teach most of what makes Favaro Favaro. Still, Nina receives her bounty hunter’s bracelet with solemn pride and excitement, and promises to “probably” not forget her master, and takes to heart his words about “the wind blowing to tomorrow”, despite not really getting them. The story of how Favaro ended up in the imperial prison is far briefer than how he met and trained Nina: in the first town over form the dragonfolk, he passes out drunk, is ratted out by a woman in exchange for gold from Onyx Guards. His magnificent afro is shaved, and he undergoes all manner of suffering under Charioce, only to be left to rot in the prison. As Kaisar starts to rot beside him, his Orleans Knights try to deal with the loss of their captain…by getting drunk in a club surrounded by pretty demons, including Cerberus, who convince Al that he’s the captain (though whether he’ll remember in the morning is dubious). Meanwhile, Jeanne befriends Nina, and when Nina explains why she’s in the slammer, Mugaro comes up. The child Nina describes is clearly the same person Jeanne suspects, but it’s funny that she’s initially unclear because Nina refers to him as a girl when he’s really just a very pretty boy. Still, Nina’s arrival and news of Mugaro serves as the catalyst for Jeanne to decide the time is right to break out. Nina, wanting to make up for not saving Mugaro before, is eager to assist her, and in Nina Jeanne has a powerful ally. And as I mentioned last week, things are not so dire, as not everyone is currently in prison. Rita isn’t just going to sit around and wait for them to rescue themselves; the end of the episode has her taking flight by umbrella into the night, ready to do some rescuing of her own, or at least assistance with same. 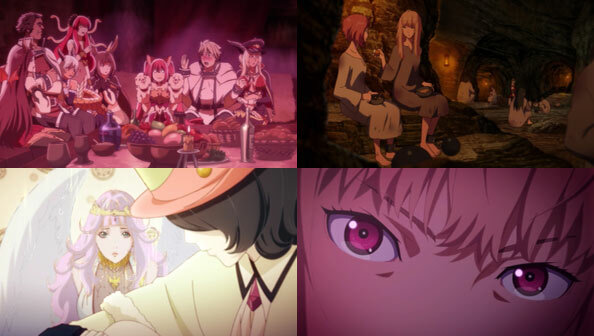 I’m stoked about the pairing of Nina and Jeanne and the reunion of Kaisar and Favaro, and look forward to seeing what the four of them plus Rita (and maybe an assist or two from a demon or god) manage to come up with to defy the evil (yet as we know, also complicated) King Charioce. I knew Favaro reminded me of someone…. Vanilla from VOTOMS. They have the exact same hair style, hair color, eye color, skin color, scumbag behavior, skill set, and even say some of the exact same lines with no variation.